Jean-Marc Vallée is ready to destroy the moviegoers with his latest drama Demolition. (Read the rave Cinemablographer review here from TIFF, where the film was the Opening Night selection.) Jake Gyllenhaal stars in this seriously powerful new film from the director of Wild and Dallas Buyers Club about a man who breaks down and puts himself back together after losing his wife in a devastating accident. Demolition opens in theatres April 8 from VVS Films, but lucky readers have a chance to attend sneak peeks of Demolition in select cities. Answer the trivia below for your chance to win tickets! 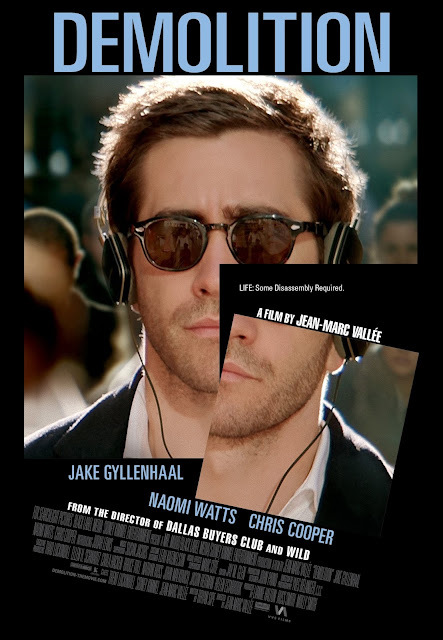 Synopsis: Davis (Jake Gyllenhaal), a successful investment banker, struggles after losing his wife in a tragic car crash. Despite pressure from his father in law Phil (Chris Cooper) to pull it together, Davis continues to unravel. What starts as a complaint letter to a vending machine company turns into a series of letters revealing startling personal admissions. Davis’ letters catch the attention of customer service rep Karen (Naomi Watts) and, amidst emotional and financial burdens of her own, the two form an unlikely connection. With the help of Karen and her son Chris (Judah Lewis), Davis starts to rebuild, beginning with the demolition of the life he once knew. In Demolition, Davis calls a vending machine company after his candy gets stuck in a machine at the hospital. What kind of candy was he trying to buy? Contest closes Monday, March 21 at noon EST. Demolition opens in theatres on Friday, April 8 from VVS Films.